An artistic view of the proposed Einstein Telescope observatory. Scientists in Europe will unveil plans today for an ambitious new observatory to seek out gravitational waves — tiny ripples in the fabric of space-time — and potentially uncover secrets of the earliest moments of the universe. After three years of study, designs for the proposed Einstein Telescope (ET) will be presented at the European Gravitational Observatory site in Pisa, Italy during their May 19 meeting. 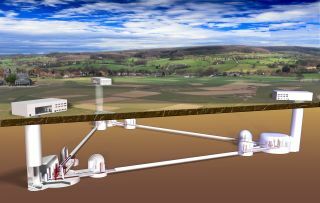 The multi-year design study involved more than 200 scientists in Europe and around the world, and the advanced observatory is pegged as a next-generation gravitational wave detector that will be 100 times more sensitive than existing instruments. During today's unveiling, project scientists will outline the Einstein Telescope's scientific goals, as well as the detector's layout and technology, timescale and estimated costs. The current estimated price tag of the observatory is $1.42 billion (slightly less than 1 billion Euros). The Einstein Telescope is expected to be capable of making precise measurements of gravitational waves, which are predicted to emanate from cosmic catastrophes such as merging black holes, collapsing stars and supernova explosions. To achieve such a high degree of sensitivity, the observatory will be built underground at a depth of about 330 to 650 feet (100 to 200 meters), which should reduce the interfering effects of residual seismic motion, researchers said. This should also enable the detector to sense the entire range of gravitational wave frequencies that can be measured on Earth, they added. The proposed Einstein Telescope gravitational wave observatory. The observatory will measure gravitational waves by detecting the very slight changes they cause when they flow through an object. It consists of three detectors, each connecting to two arms more than a mile (several kilometers) long. When a gravity wave passes through, it will stretch and shrink the arms' lengths slightly, depending on their alignment with the direction of the wave. The Einstein Telescope design study was supported by the European Commission, which is an executive body of the European Union. The Commission allocated approximately $4.3 million dollars (3 million Euros) for the study. "With this grant, the European Commission recognized the importance of gravitational wave science as developed in Europe, its value for fundamental and technological research, provided a common framework for the European scientists involved in the gravitational wave search and allowed for a significant step towards the exploration of the universe with a completely new enquiry instrument," said European Gravitational Observatory director Federico Ferrini, who served as project coordinator of the Einstein Telescope design study. The new telescope is a joint project of eight European research institutes, under the direction of the European Gravitational Observatory. Scientists from institutions in the United States and Japan were also active collaborators in the design study. A separate joint U.S.-European plan to build a space observatory to seek out gravity waves was recently cancelled because NASA was unable to contribute the funding required for the ambitious mission. The project, called the Laser Interferometer Space Antenna, or LISA, was slated to search for ripples in space-time that were predicted by Einstein's theory of general relativity. The mission was a partnership between the European Space Agency and NASA.